We go through makeup remover wipes so quickly in our house. Three of us wear makeup every day, then add several performances where stage makeup is required and teen girls trying out new makeup techniques! We can easily go through 2 packages of makeup remover wipes in a week! I was spending over $30-40 per month in makeup remover. I often use coconut oil to remove my own makeup but it didn’t work well for my girls. They prefer something less oily. 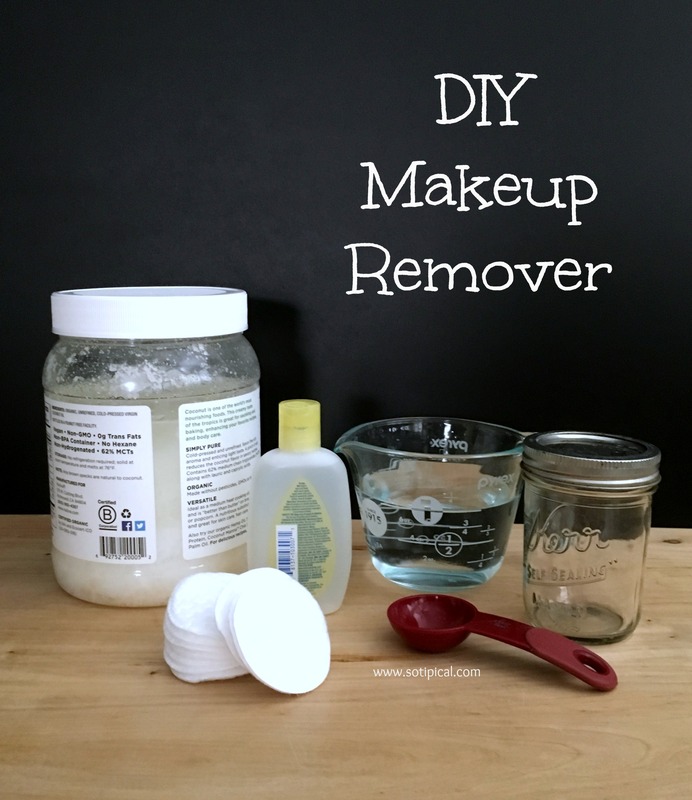 I heard that baby shampoo can be used in makeup remover recipes so I tried making some. It took me a few tries to get the right consistency for us. 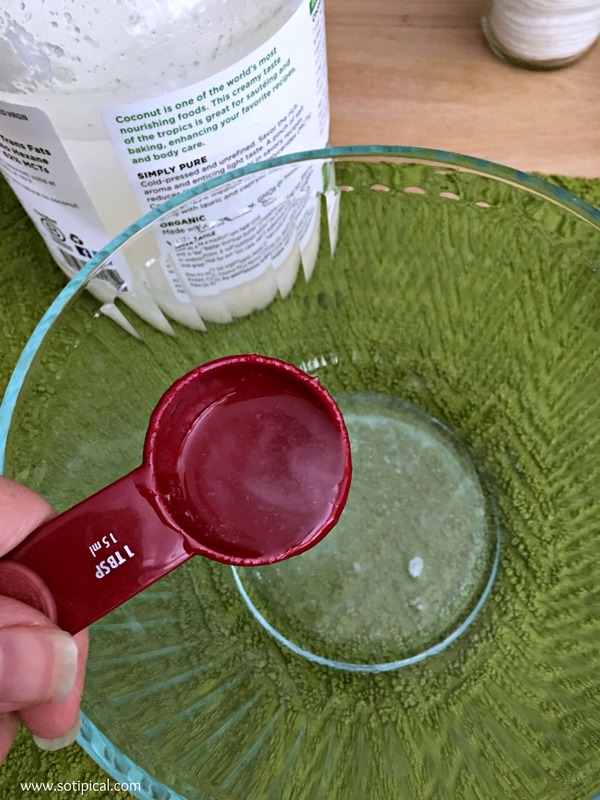 In a small bowl, add 2 TBSP of melted Coconut Oil and 1 TBSP of Baby Wash/Shampoo. Gently whisk together, while slowly adding 1 cup of Purified Water. Make sure the ingredients are well blended and dissolved. You may need to allow it to sit for a few minutes, then whisk the solution again. 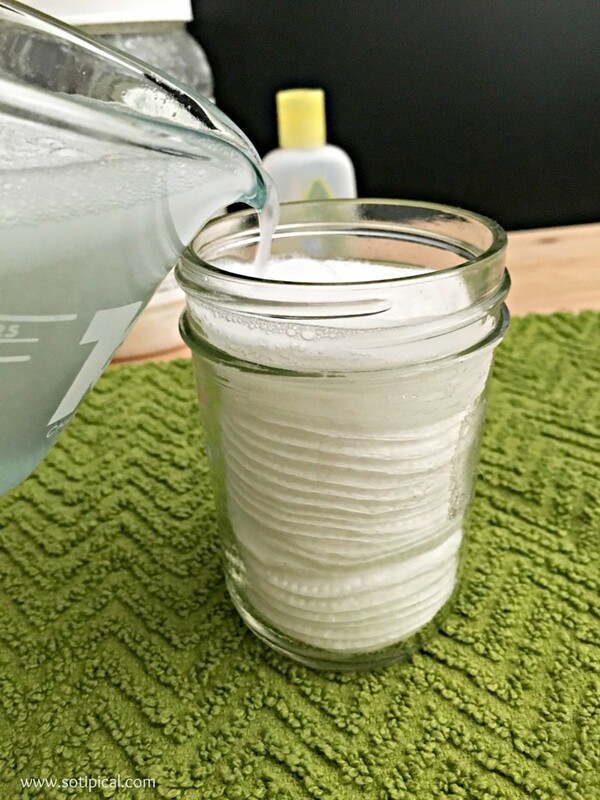 Fill the clean, empty jars with the round cotton pads. Pour enough of the solution to moisten the pads. Push them down a bit and add more pads. Pour a little more of the solution over the top. Repeat until the jar is full, but not overstuffed. You may need to mix the solution again before adding it to the jar, as oil and water will often separate. This does not really happen after it absorbs into the cotton rounds. Be careful not to over saturate the pads. If they’re too wet, the pads become difficult to work with and feel sticky. The first time I made this recipe, I tried to add all of the solution to my 2 jars and it didn’t work to well. Now I use about half of the solution and store the remainder in a small bottle or jar. 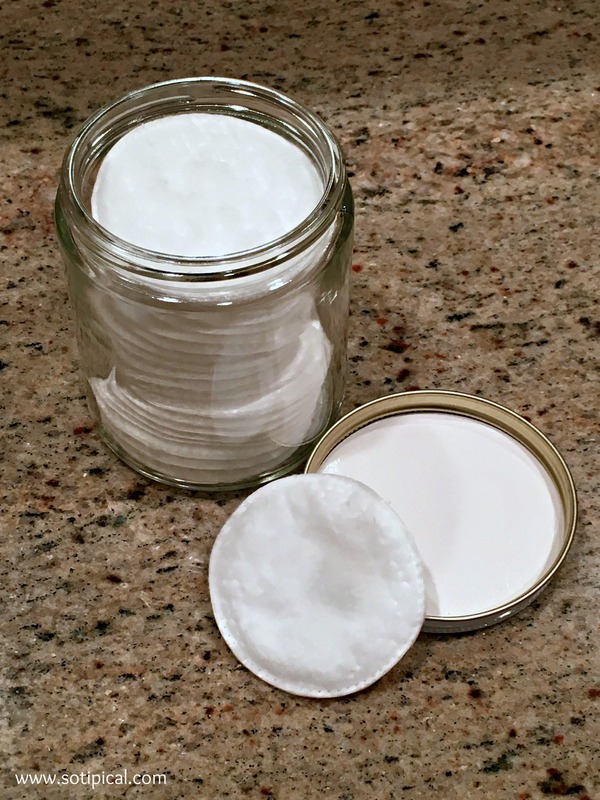 As we begin to run out, we add more cotton pads to the jar and just pour a little of the remover over the top. 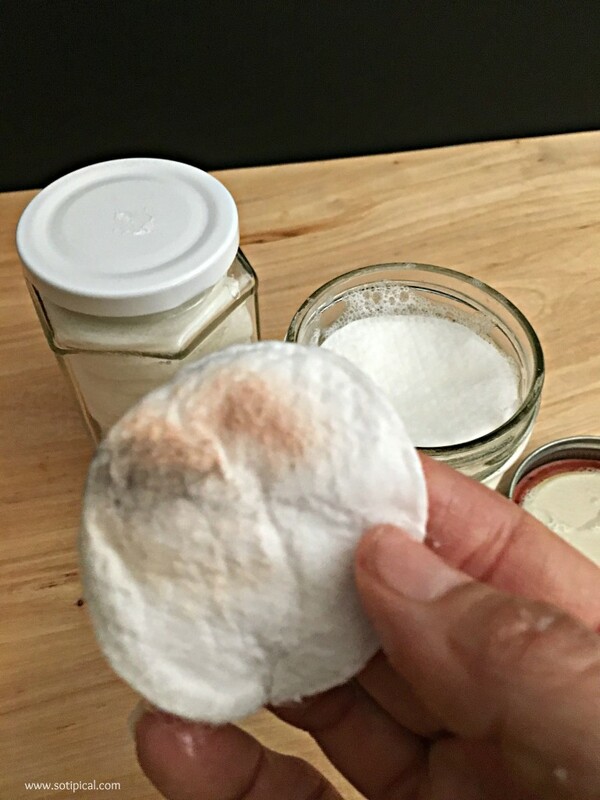 Though it will remove all makeup, we especially love this recipe for removing eye makeup. I have found it to be very effective in removing mascara. It has worked out pretty well for us and is much more economical than purchasing face wipes. I had the coconut oil, but a jar could cost about $6. The travel size of the baby shampoo is $2 and the large pack of cotton pads cost under $5. For $13, we have just over 2 months worth of makeup remover for 3 of us! Now THATS a deal! I love home made makeup tips. Coconut oil has been my skin savior. My skin loves coconut oil more than anything else. It makes my skin supple and glow. But I never thought of using it along with a baby shampoo as a makeup remover. Great article! I really love coconut oil too! Thank you for sharing these tips! Actually, I spend a lot of money on makeup remover as well and I don’t like this fact. I will definitely try this! Now that I make it, I can’t bring myself to buy the wipes anymore. Wow! Though I get used to the Channel makeup remover, I think your variant is healthier for the skin. I will definitely take it into account as it, furthermore, saves money! Good tip.